Treat your feline to a meal that’s as special as he is with Adore Salmon & Whitefish canned cat food from CANIDAE. This feast features chunks of salmon, tuna and whitefish as the top ingredients, along with sweet potatoes, carrots and peas. But simple ingredients don't have to be dull—the lavish broth in this entrée delivers a smooth texture and meaty flavor your furry friend is sure to adore. Made without grains or carrageenan, this recipe is specifically formulated to be digestible and ideal for the cat with allergies or food sensitivities. Salmon, tuna and whitefish are featured ingredients in this gourmet-inspired dish that also includes potatoes, carrots and peas. 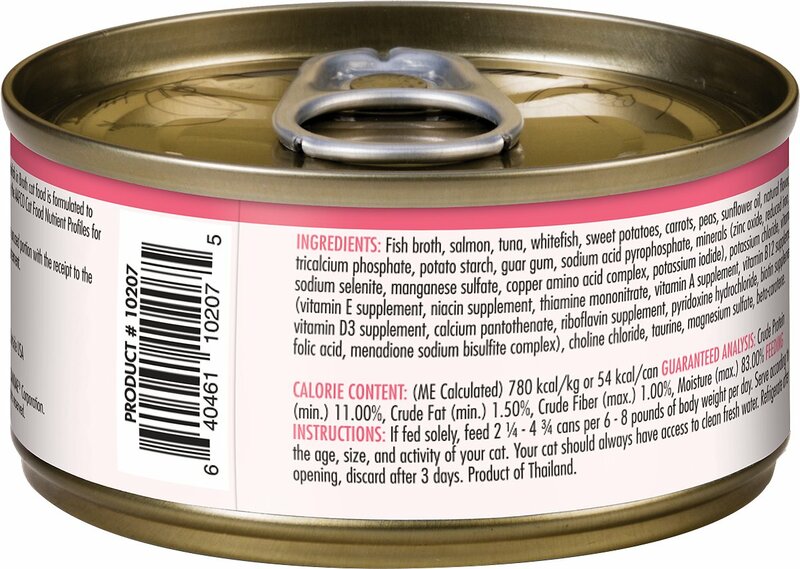 Fish Broth, Salmon, Tuna, Whitefish, Sweet Potatoes, Carrots, Peas, Sunflower Oil, Natural Flavor, Tricalcium Phosphate, Potato Starch, Guar Gum, Sodium Acid Pyrophosphate, Minerals (Zinc Oxide, Reduced Iron, Sodium Selenite, Manganese Sulfate, Copper Amino Acid Complex, Potassium Iodide), Potassium Chloride, Vitamins (Vitamin E Supplement, Niacin Supplement, Thiamine Mononitrate, Vitamin A Supplement, Vitamin B12 Supplement, Vitamin D3 Supplement, Calcium Pantothenate, Riboflavin Supplement, Pyridoxine Hydrochloride, Biotin Supplement, Folic Acid, Menadione Sodium Bisulfite Complex), Choline Chloride, Taurine, Magnesium Sulfate, Beta-Carotene. 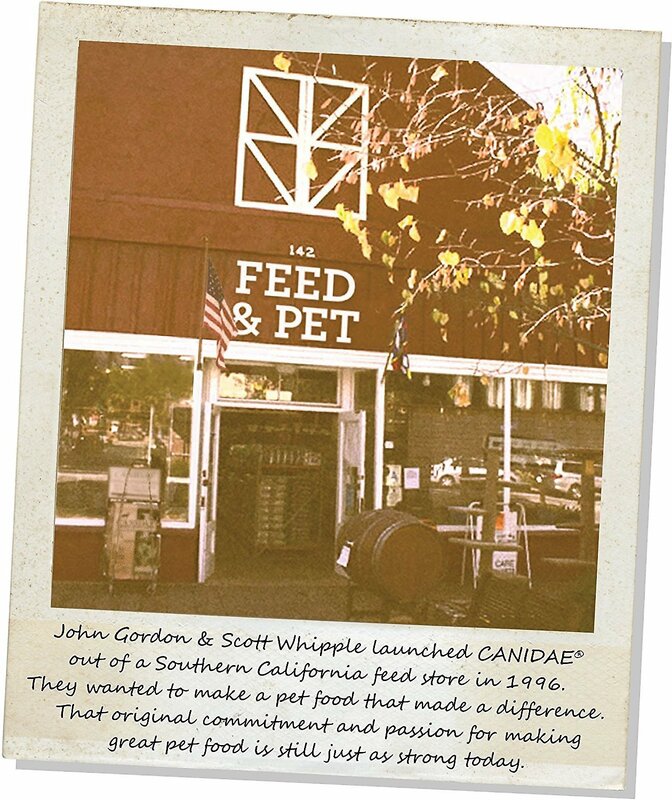 2.46-oz can: If fed solely, feed 2 1/4 - 4 3/4 cans per 6-8 pounds of body weight per day. 5.5-oz can: If fed solely, feed 1 - 2 cans per 6-8 pounds of body weight per day. 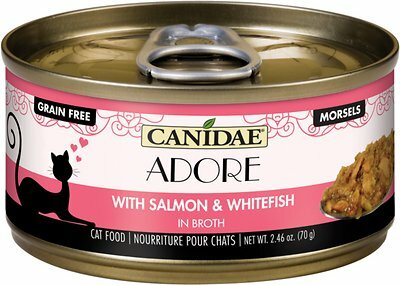 My cats tend to throw up a lot, but not this food. It is fish with no chicken. My cats can't eat poultry. Unfortunately, it comes in a 2.4 oz cans which is an odd amount. My cats need 1.5oz of food each meal. 3 oz cans are perfect to split.